It is the biggest, and possibly the most beautiful, sand island in the world. Its freshwater perched lakes include the largest (Boomanjin at about 200ha), some of the highest (Boomerang Lakes at 120m) and one of the bluest (Lake McKenzie). It cradles as many as half the known dune lakes on the planet. Its sand dunes have been forming over the last 720,000 years and sandblows like Hammerstone continue to alter the landscape, swallowing Lake Wabby as we speak. Its satinay and brushbox forests are the most extensive in the world and its rainforests soar with roots fixed in sand. Fraser Island’s east-coast beach driving runs for 125km from Cooloolo Creek to Sandy Cape, with 4WDs travelling at up to 80km/h and with light planes also using the beach as a runway. Its 800km or so of inland tracks criss-cross from east to west and north to south like arteries clogged with white sand and driving on them is like a Mad Max rally through lumpy mashed potatoes. Drivers from the wildly inexperienced to fully-equipped veterans, Troopies crammed full of backpackers with overseas licenses and too much luggage, as many as 50 monster 4WD tour buses crammed with up to 40 tourists each on time schedules, churn up sand all over the place like coffee grinders working overtime. In 1970, 5000 people visited the island. Numbers increased every year and by the 1980s there was a camping and track infrastructure to cater for visitors, numbering less than 100,000 in 1980. Fraser was placed on the World Heritage List in 1992 in recognition of its outstanding and unique natural features; ironically, placement on this list guaranteed a boom in tourism that now sees about 360,000 visitors annually. The Maheno Wreck is a popular Fraser Island attraction. It would be hard to find a 4WD destination more written about or more visited. There are sheet maps, there are guidebooks, there are blogs and there are trip notes galore. So what is there left to say? Well, we can say that Fraser Island has a problem: a lot of visitors. As avid RVers, we can decide to be part of the problem or part of the solution. So here is a guide to minimising our impact on Fraser. The island has seen over 120 vehicle accidents since 2003, more than one quarter of them being serious. Of those, 60 per cent involved foreign drivers. To reduce injuries, the passenger number in rental vehicles has been lowered from 11 to seven and luggage may no longer be carried on roof racks. In a raid conducted in July of 2009, more than half the inspected rental 4WDs did not meet the standards of a road worthy test. Aussies visiting Fraser make up 40 per cent of accidents, and there are a number of things we can do to reduce that. Obey the speed limits and note that on the eastern beach this is 80km/h reduced to 40 in shared zones, such as where light planes may be landing. Take into account washouts, rocks exposed by waves, tides, patches of soft sand, oblivious people fishing/sunbathing/walking/photographing on the beach who can’t hear oncoming vehicles above the wind and surf, other vehicles driven recklessly and or thoughtlessly, 4WD tour buses driving at maximum speeds to meet their tight schedules, and there is only one conclusion to draw: drive defensively and below the limit at an even, steady speed and keep your wits about you at all times. Plan your drive around the tides and stay off the beach two hours either side of a high tide. Check before driving across creeks flowing onto the beach, especially Eli, Wyuna and Coongul creeks, as all of these have been known to gobble up 4WDs with glee. Keep to the left of oncoming traffic and to the high side of airplanes. Driving on the western beach is only for the very experienced, preferably travelling in a convoy of at least two. Do not drive at night. While the beach poses the greatest danger due to speeding and silliness, the inland tracks pose the greatest challenge. They are narrow and can have cavernous ruts, sharp bends and steep crests. At rush hour, when both tours and 4WD visitors are trying to get on and off the island all at the same time, there can be a parade of vehicles waiting in line for their turn to get some momentum up a hill. To help ease the crunch, give way to 4WDs travelling downhill, anyone towing, and to trucks and buses. Stay below the 35km/h limit and always drive to the conditions. Make sure everything in and on your vehicle is well tied down because all of it, including you, is in for a thorough thrashing. All the usual road rules apply. One way to reduce your impact on, and increase your enjoyment of, the island is to go where (and when) others don’t. Visitors regularly get off tour buses at Lake McKenzie, Central Station, Pile Valley, Eli Creek and the Maheno Wreck. All of these are well worth a look-see but plan your visits before 10.30am or after 2.30pm to avoid the tours. Through the middle of the day, just-as-pretty Lake Boomanjin, Lake Barga, Lake Birrabeen and Lake Waddy are much quieter retreats. Experienced four-wheel-drivers with a high-clearance vehicle can try one or more of the beautiful inland scenic drives that avoid crowded beaches. The most relaxing way to see the island is on foot, so consider one of the many walking tracks including sections of the Fraser Island Great Walk. 4WDs have a major impact on the island’s tracks and therefore its ecology. 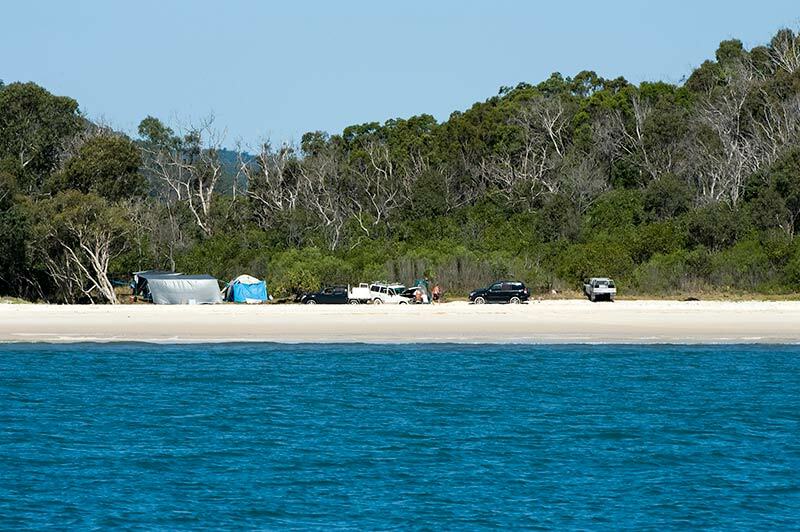 FIDO, the Fraser Island Defenders Organisation, estimates that as much as one tonne of sand on the island’s tracks is shifted for each visitor, with a number of negative results including run-off into the lakes. Tracks are impacted by wheel-slip, the volume of traffic and the weight of the vehicles (remember, up to 50 buses capable of carrying 40 passengers each). Skilled, experienced drivers with the correct tyre pressure and proper load adjustment, with an even use of power and low speed (not low range), and who are not towing a caravan or trailer and are able to reverse back into a passing bay to give way to others have the least impact on the tracks. So consider a 4WD sand-driving and vehicle-recovery course if your skills could use some honing. Take a few minutes while crossing on the vehicle barge to engage 4WD and lower your tyre pressure to a maximum of 30psi (many recommend 20 to 25psi depending on the weight of your load). Stay between the low and high tide line on the beach; this often means waiting out a high tide to avoid driving through soft sand and disturbing or even killing nesting and resting birds and damaging important barrier vegetation along the foredunes. Use existing campsites and tracks to access beach campsites; it is illegal to drive over the dunes. And don’t even think about towing a caravan on the island. If you do tow a trailer, be sure it is an offroad model with high clearance and remember to lower the tyre pressure. Choose a vehicle barge that lands at the nearest point to where you’ll be camping. For example, Central Station is the closest campground to the Wanggoolba Creek barge. About 90,000 of Fraser’s annual visitors camp on the island, equal to about 1000 campers every night. Two-thirds of the campers are Australians staying an average of four to five nights while the rest are overseas campers staying an average of two to three nights. To reduce your impact on Fraser’s natural environment, consider staying at one of the accommodation facilities such as Kingfisher Bay Resort. The environmental impact from beach-camping is greater than from organised campgrounds. Estimates are that every beach camper adds 4.3kg of poo and 18L of urine to every lineal metre of sand along the eastern camping zones, contaminating the ground water in those areas. To help combat this, QDES has an ongoing program to decrease the number of camping sites on the beach and increase the number of organised campground sites with facilities. One obvious solution is for all beach campers to bring their own portable toilet. Many already do so; however, a bit of planning is involved. By using biodegradable toilet paper and an eco-friendly product such as Poo Powder, Biomagic, Odour-B-Gone or even the Coles/Woolworths/IGA home brand nappy treatment powders, your portable toilet will have less impact than if a chemical product is used. Some companies claim their biodegradable products make it safe to dispose of the contents in drop toilets or a sewage treatment system; however QDES states: “Portable toilets contain chemicals, such as formaldehyde, which kill any bacteria used to break down waste in sewage treatment facilities. Nappies and personal hygiene products should be bagged and placed in provided bins or taken off the island with you. Human waste is not the only problem. The annual 4WD Queensland Fraser Island Clean Up, under the supervision of QDES, collected seven tonnes of rubbish over one long weekend, including 131,000 pieces of hard plastic. There are now recycling stations at Eurong, Cornwells, Central Station and Happy Valley, and of course these should be used. So bring along some large, heavy-duty rubbish bags and take all rubbish, including what you find left behind by other campers and items washed up on the beach, to the bins provided at Cornwells, Maheno, Red Canyon, Waddy Point, Eurong, Eli Creek, Dundubara and other established campgrounds. Better yet, take it off the island with you when you leave. By removing as much packaging as possible before leaving home, you can reduce the amount of rubbish you will have to deal with. Camping at organised campgrounds has the least impact because specific sites, rubbish bins and toilets are provided. All campfires are banned on the island except in the designated fire pits at the Dundubara and Waddy Point campgrounds. Do not use soap of any kind, or lotions including sunscreen and insect repellent in any of the lakes. Fish cleaning is prohibited at all camping areas; this should be done on the beach with the remains buried at least 50cm deep just below the high tide line. Bait bags and fishing line should be disposed of in bins. Bait must be kept in a sealed container (to avoid attracting dingoes). Only ocean fishing is allowed. Fraser Island has been challenged before, from logging and from sand-mining. Today, its greatest challenge is tourism. Those of us who love the island and visit it regularly aren’t tourists, though. We are its greatest admirers and, hopefully, its most enthusiastic caretakers. Australian campers on Fraser consist mainly of family groups: many of the parents were brought here as children and now want their own children to have that same wondrous camping experience. Hopefully, today’s children will return as grown-ups with their own families and the cycle of visiting and caring for Fraser Island will continue. The tragedy would be if, instead, we drive Fraser to the brink and beyond. Information about driving on sand, vehicle access permits, camping permits and bookings, dingo safety, species lists and QDES centres where you can pick up a Fraser Island World Heritage Area Visitor Guide. There are park offices at Eurong and Dundubara. If you prefer not to expose your own 4WD to the challenging, and damaging, elements of Fraser, then consider renting a 4WD in Hervey Bay, Rainbow Beach or on the island at Kingfisher Bay Resort. QDES campgrounds include six organised areas and a number of beach camping zones. Food with all extra packaging removed. Limited supplies, LPG gas and fuel are available at Kingfisher Bay Resort, Eurong Beach Resort, Happy Valley and Cathedral Beach. Food should be stored in lockable containers at all times to avoid attracting dingoes. Drinking water. Untreated water (which should be boiled or treated before drinking) is available at Central Station, Eurong QDES, Dundubara and Waddy Point. Bring water-purifying tablets. First aid kit and prescription medicine. Shovel, axe, sand recovery gear, tyre-pressure gage, air-compressor. Fill up with fuel before leaving on the barge. Milled timber offcuts for a campfire in the designated fire pits at the Dundubara and Waddy Point campgrounds only. Cash with plenty of gold coins for the showers at the campgrounds. Mobile phone coverage is generally not available; public phones can be found at Eurong, Happy Valley, Cathedrals on Fraser, Kingfisher Bay and Central Station. Portable toilets are required at Coolooloi Creek and Cornwells group camping area; they are recommended at all other camping areas that do not have toilet facilities. Portable toilet waste disposal facilities (https://www.npsr.qld.gov.au/parks/fraser/faq.html#where_can_i_dump_the) are available at Waddy Point, Dundubara, Woralie Road, Cornwells camping zone, Wanggoolba Creek barge landing and Hook Point. Help prevent the introduction of weeds and pests by cleaning vehicle tyres, tent pegs and ground mats before arriving on the island (there is a car wash on Boat Harbour Drive opposite Bunnings in Hervey Bay). To reduce damage to your 4WD from sand and saltwater, make the car wash your first stop when leaving the island. Linda Lee Rathbun is a travel writer who has toured extensively around Australia. She has a particular love for Aussie wildlife.